We mostly stuck to this design when creating it all. Only “mostly” because as soon as you start implementing a design, reality kicks in – you learn new things along the way so respond accordingly. This is a good thing, a great thing actually as it means you’re working with the landscape, letting it unfold naturally rather than enforcing your fixed ideas onto it. When we work with clients we try and emphasise this – that the design we provide them will almost certainly change as you create it – embrace that. 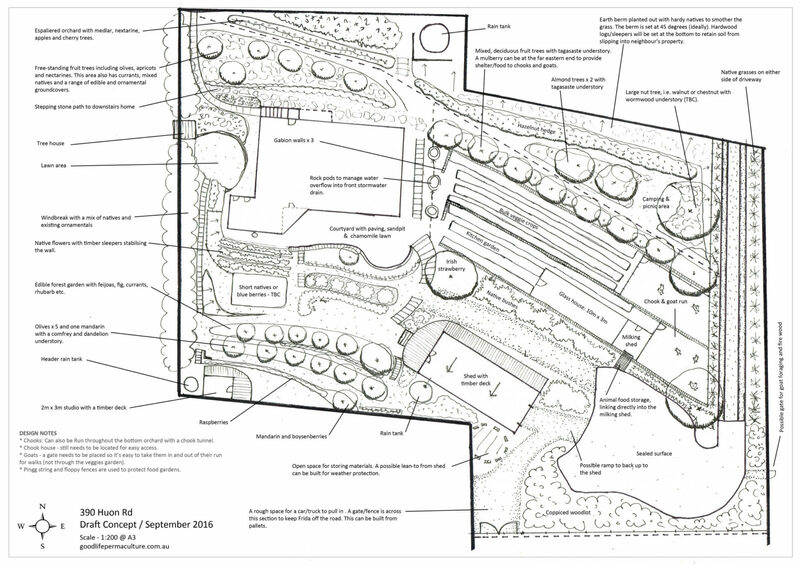 Back in September we started drafting up our new “whole of property” design – it looked like this. 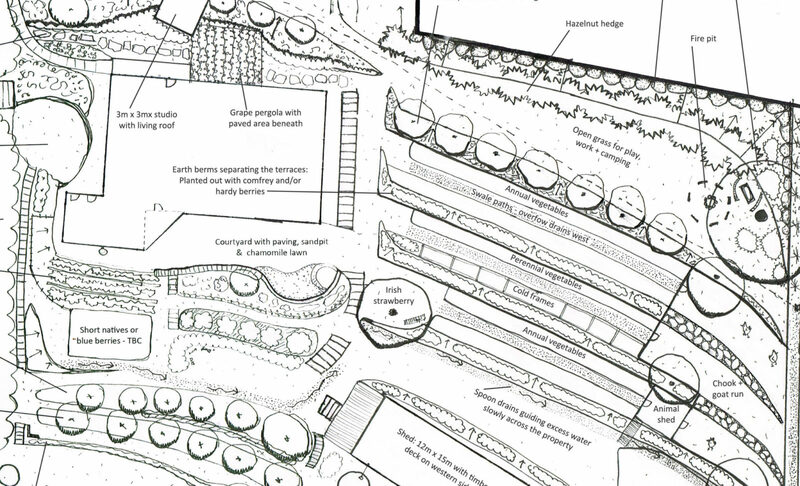 We let this sit for a while – talked extensively with our excavator driver who’ll be doing all the terracing and building our driveway and quickly knew we had to make some changes to make the design “smarter”. By smarter I mean we had to find a way to keep all the soil onsite, get ride of the retaining walls as they’ll blow our budget (we’ll build earth berms instead and grow useful plants on them), make the passive water harvesting system more elegant and make every terrace accessible with a wheelbarrow so you don’t have to do awkward carrying/lifting across our steep slope. The new draft looks like this…. We fully expect to change this design *again* before we start implementing it this January. We also fully expect to tweak it *during* implementation as our landscape is a living entity that we work with and not against. I’ll provide a second (and maybe third) chapter to this blog to show the design and implementation developments as they unfold. The key emphasise we’ll continue to demonstrate is the responsiveness and flexibility we try and embody when working with land. It’s already perfect as it is, and while we’re introducing some massively significant changes we know we can still do this within the natural integrity of the landscape. Watch. This. Space. Save yourself money and grow your own rootstock. 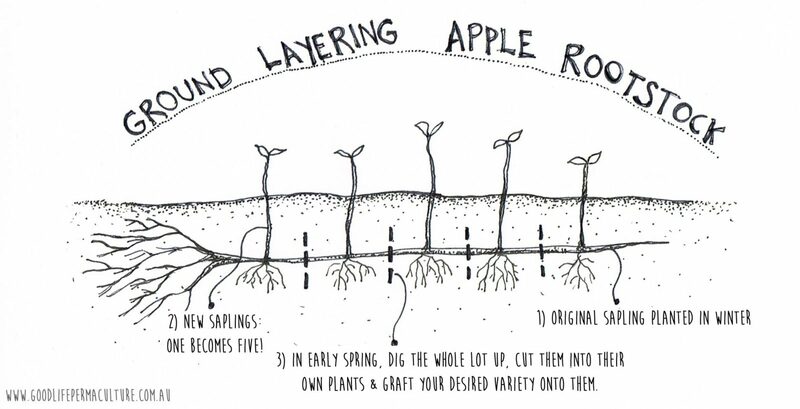 Just dig a long trench the same height of the tree and bury them (each in their own one) – they’ll sprout multiple times from their trunks and grow more trees. Our neighbour is one of the best growers around, so we do whatever she tells us. We dug two shallow trenches, popped them in and forgot about them. 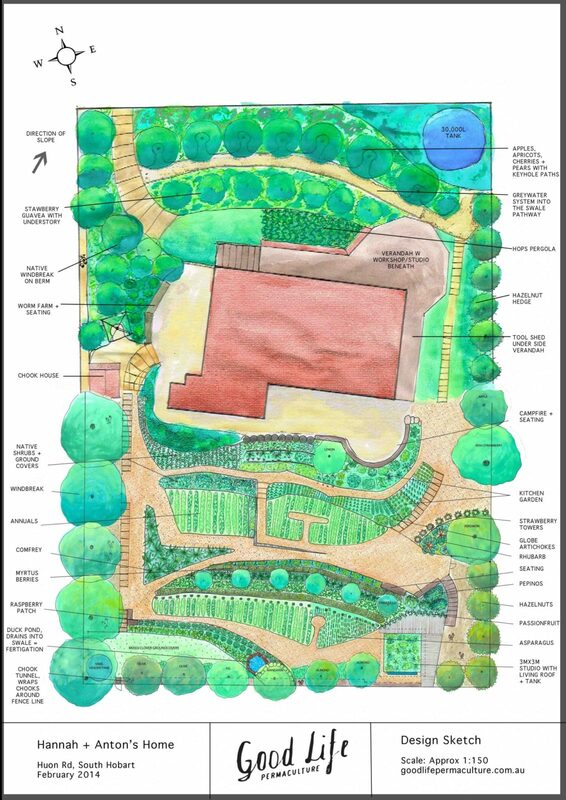 The sketch below outlines the key steps to do this whole process – super easy. 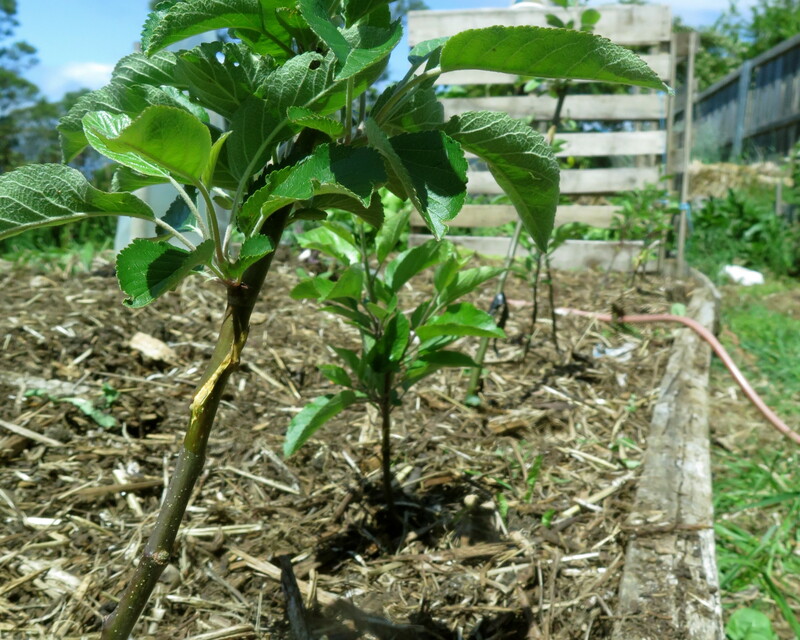 We now have ten young apple trees that we’ve since grafted onto with our desired apple varieties. What varieties did we choose? The sturmer for its good storing abilities and the red galaxy – an older variety with pink flesh. We couldn’t find any reference to this variety, but how could we go past it with a name like that! Thanks to Fat Pig Farm for letting us lovingly raid their old orchard. 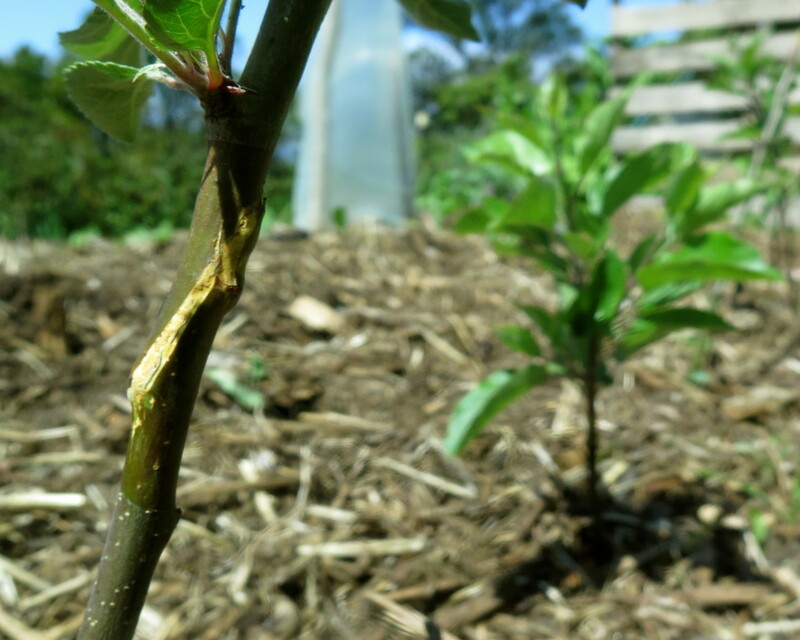 The young graft line, healing beautifully. We’re storing all the trees in one trench on the edge of our young olive grove until next winter, when we’ll transplant them into their permanent home in some new ground we’re prepping this summer. Until then, they’ll put on good growth so they’re ready for fruiting the following season. 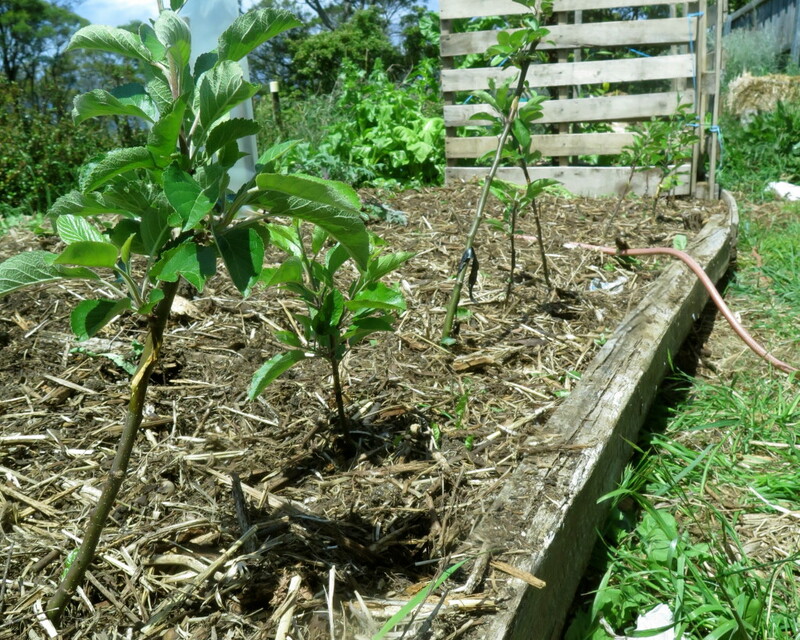 If we were to buy all the plants we wanted to grow in our property, it’d add up to many, many thousands of dollars. Learning these life skills isn’t only empowering and deeply satisfying they look after the piggy bank too. But mostly, they’re just deeply satisfying – that’s what drives us – developing *useful* skills that all add up to having a good life. Did you know the average Australian household is 214m2. To put that in perspective: Denmark’s average size is 137m2, America comes in at 201m2 , France is 112m2 and Hong Kong is a modest 45m2. So yep, Australia is “winning” in the worse way as the bigger your house, the bigger your consumption levels. As you generally need more energy to run the home, more things to put in it – more of everything. 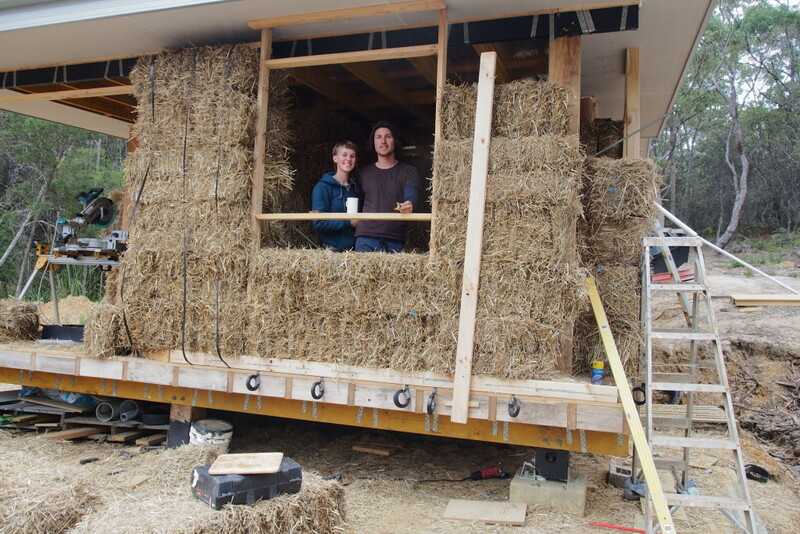 In the midst of the tiny house movement, we’d like you to meet Yani and Ben. 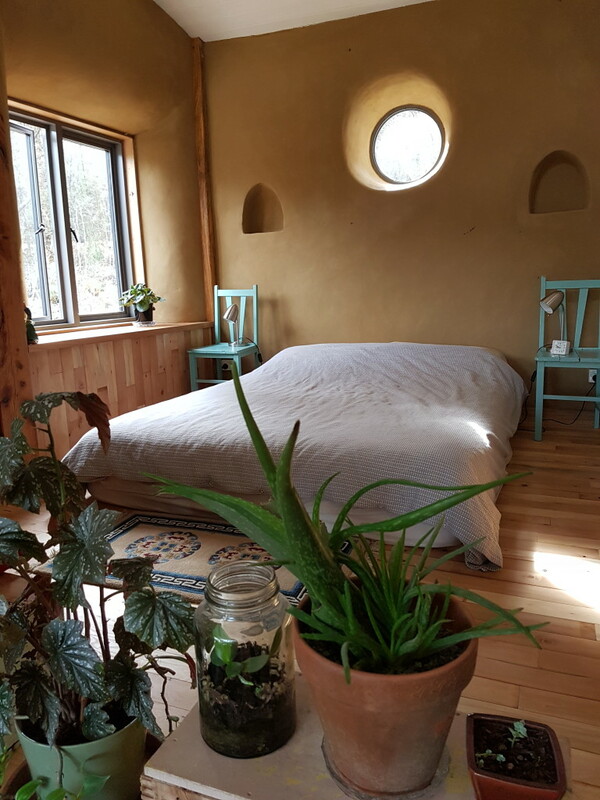 We first met Yani as a student on one of our permaculture design courses and have kept in touch ever since. 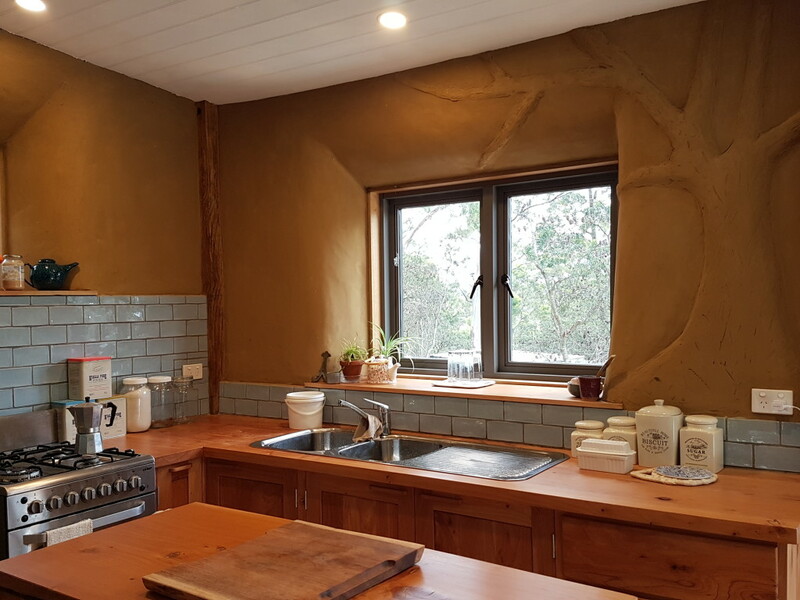 They’ve recently finished building their own small strawbale home in southern Tasmania – not quite a tiny home but tiny compared to the average Australian house, coming in at just 44m2. After two and a half years as owner builders of our little house, we now live in the most beautiful space we could imagine for ourselves. 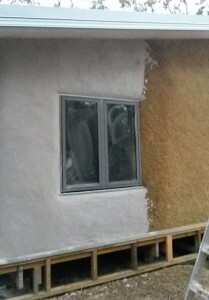 With the help of many builders and experienced people we were a part of constructing the build every step of the way with the clay render definitely being the most hands on. We love every bit of our place and have achieved all the key elements we dreamed of. 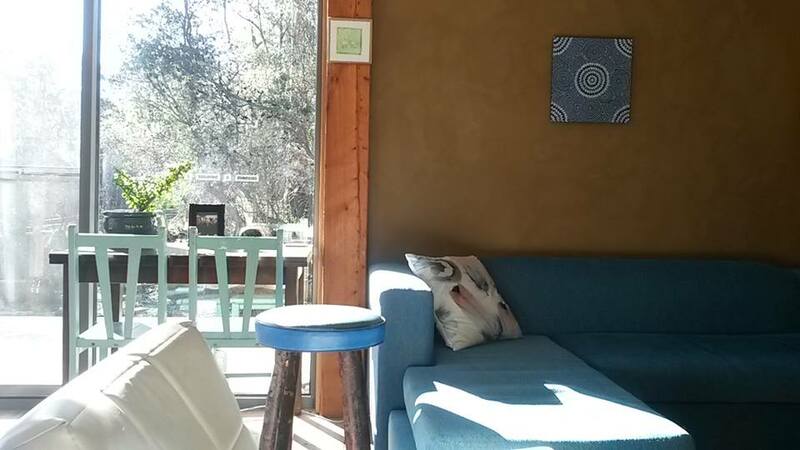 Our home is around 44sqm and includes kitchen/living, bedroom, enclosed bathroom and we have a composting toilet outside. 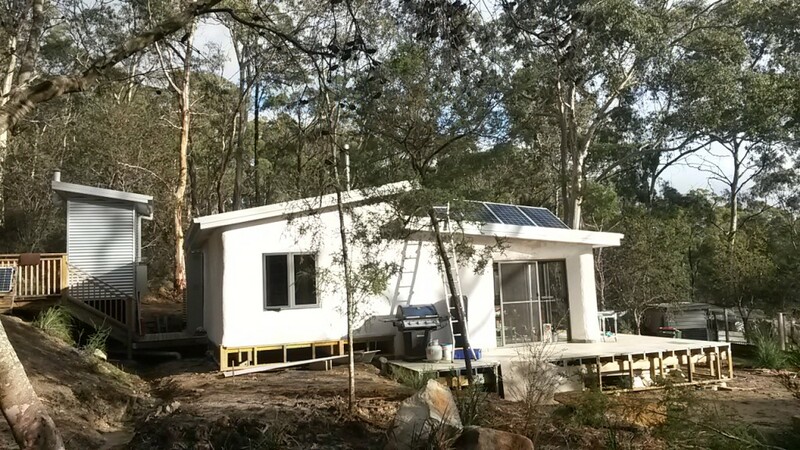 We are completely off grid with solar power, gas hot water and cooking, a wood heater (that also has oven and cook top) and collect all our rain water. 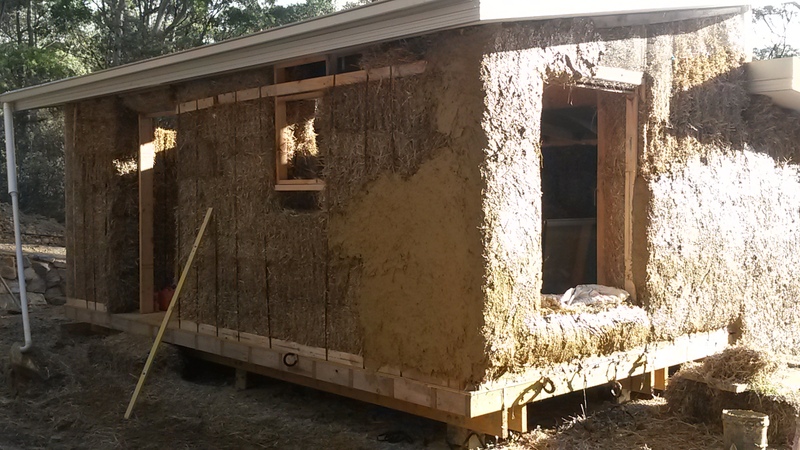 The insulation that straw provides is superior to anything we’ve come across, the rendered walls give great protection against bushfire and the straw itself is a by-product of grain harvest. We are on about 5 acres of bush with a vegetable garden, food forest, two ducks, two ponies and two dogs. Recently, we started making our own bread after realising just how many plastic bread bags we were going through! We will continue to aim towards a low waste lifestyle and think that a small home is a big part of that. Obviously other benefits in building a small home is that it’ll cost less, which is always a helpful bonus! I think about small homes a fair bit – what is it in our culture that often makes people think bigger is better? When is enough, enough? Our own house was built by someone else in 1925 and is 110m2. Its always felt big to us, admittingly having a little toddler makes it feel smaller, but not enough that we could ever consider having more. If anything we dream about living in something smaller – especially when we see folks like Yani and Ben create well designed homes that meet their needs in the most beautiful, functional and soulful way! *Big thanks to Yani for providing all the photos.